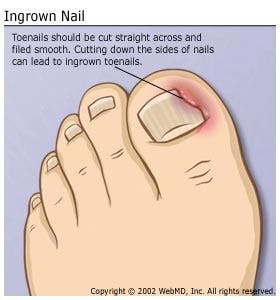 Having a ingrown toenail could ruin your day and a lot after if you don’t have it fixed. Yet, even though ingrown nails and other nail-related conditions are common and pesky, very little is known about them. Now, a team at University of Nottingham have published a mathematical model that explains what forces are tugged beneath your finger nails and what exactly happens when this delicate interplay is upset. Of course, there’s a piece of practical advice: always trim your nails with the curve bits following a parabola. The Greek physician Paul of Aegina was among the first to discuss surgical treatments for nail conditions in the 7th century, but humans have been forced to live with annoying pain long before. To understand how ingrown nails come to be, we first need to discuss, however, how nails are formed and what causes them to grow and pop from under your skin. Basically, nails are nothing but dead skin cells coated with a hardening protein called keratin that stick out from the half-moon-shaped “lunula” at the base of the nail toward the fingertip. On average, fingernails grow by 0.1 to 0.2 millimeters per day, but it’s no smooth sailing. Keeping the nail in place are adhesive molecules behave like ratchets: They grab onto the nail above them, and as the nail slides forward during growth, they tilt and stretch, trying to hang on, until eventually the bond breaks. Once this happens, the molecules just attach themselves to another piece of nails. Sometimes, though, the balance between nail growth and adhesion is interrupted. When this happens, the nail might change shape to compensate and end up in all the wrong places – like under your skin and into live flesh! Ingrown toenails happen when the nail extends into the flesh alongside the nail. Kids, teenagers, and pregnant women are among the most vulnerable because raging hormones are causing the nail’s growth to outpace adhesion, according to the University of Nottingham model. Pincers result from the opposite problem. In this condition, the sides of the nail curve down and towards each other, forming a “C” shape. Rauch’s model suggests that in this condition, adhesion overpowers growth, which may explain why pincers are more commonly found in the elderly, whose growth is slower. Soak your foot in a mixture of hot (or as hot as you can stand it) water and Epsom salt. Do this for 15-30 minutes at least twice daily. The goal here is twofold: to soften the toenail and prevent the ingrown nail from becoming infected. Trim your toenail, taking extra care around the ingrown section. Make sure your toenail is cut perfectly straight without any pointed parts near the edges. Toenails that are rounded off have an increased likelihood of growing into the skin, causing ingrown nails. Keep your toenail slightly raised. Putting a small piece of cotton between your toenail and the skin should keep the ingrown toenail from coming back. Remove the cotton daily to prevent infections. In fact, you should apply infection-preventing ointment to the site and keep it bandaged. Neosporin works fine for these purposes. Don’t wear socks or shoes, at least when you’re at home. Rauch is actually a veterinarian and is currently adapting the model for animals, where nail health is a big problem and can cause serious financial deficits.